Simple, straightforward and strong clip to hold your map or cue sheet securely. 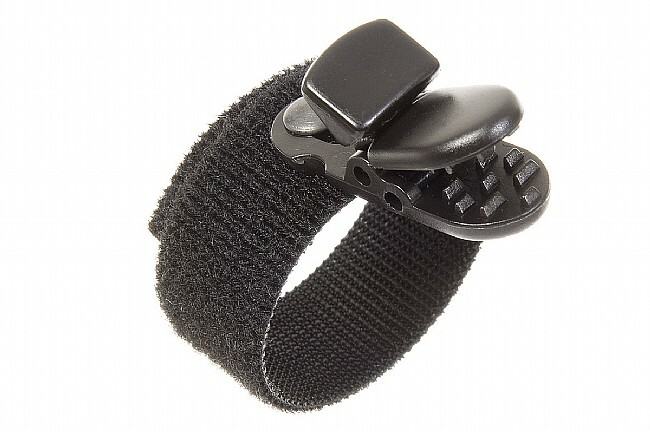 Attaches to your bar stem or handlebar with a simple velcro strap. Low profile and small teardrop aero shape mean you can leave it on your bike even when not in use. A solid brass rivet with protective black coating and a plastic clip mean the CueClip will never rust. Great for securing mapscue sheets to handlebar for touring. Easy to use and holds route maps securely during the ride. I have foam grip tape and the strap doesn't slip or rotate due to road vibration. Sturdy clip that holds tight! This is a well made product that does exactly what you bought it for. Mounts to bars or stem and holds your map, notes or cue sheet securely. Well designed. Great for rides where quick viewing of a cue sheet is necessary. Somebody Had a Good Idea! This is so simple - and it works! My bike group maps and direction lists can usually be folded down to 14 sheet or smaller - and this is just the ticket for keeping that in view and handy. A bigger sheet of paper would probably flap annoyingly in the wind - but this eliminates the plastic map carrier - that would cover my computer and otherwise not quite fit on the bar of my main road bike ('11 Jamis Xenith Endura 1). The guys who jury rig clothes pin holders are going to be jealous! Why did I wait so long to get one of these. While riding. With this handy clip, all I have to do is look down and there is my directions. the locking clip wont let even the smallest sheet blow away in the wind. Great little device helps on club rides, etc holds the route slip so you dont have to dig in your jersey every few miles to check if your lost or not. I put my cue sheet in a ziplock bag anchored to two of these clips. The sheet doesn't flap around and is well placed for quick reference. I tested the product on a bus&bike ride at freeway speeds-map stayed secure. This is a great product if you don't have a handlebar bag. Agreed! If you're on a ride that requires a cue sheet, these clips are essential (unless you have another form of map case). In the rain, you can put your cue sheet in a re-sealable baggie and then clip it. Great map and cue sheet holder. This is a must on those supported casual rides where they don't mark the turns to well. Holds the sheet well. This is a great little clip to hold maps when on an EVENT Ride.. It keeps it in front of you to glance at easily without reaching into your back pocket to retrieve the map that could be slightly soggy from preservation . I would like it better if it had a plastic sleeve to slide the map in so it wouldn't blow in the wind making the sides flip up too much and sometimes blow out of the clip or tear out of it from a furious head wind. For the price, I would recommend it,, it is better than the back pocket idea. I just used this for the first time to hold a laminated directions card for a century ride. A little masking tape on the card allowed the clip to hold it very securely. Ease of use, it holds a cue sheet, not much else to add. Easy to use, reliable. No more loosing cue sheets. It works better when attached to stem. It can slide a little when on handlebars. I can't live without this great clip! I use the clip to hold maps or directions I've written out when cycling - especially when trying a new route. Whether you put the map in plastic or just clip it on as paper, the clip never, ever, lets go. Come wind or rain, it is amazing.